The Copa Eva Duarte was a Spanish football tournament organized by the Royal Spanish Football Federation (RFEF) and contested by the winners of La Liga and the Copa del Generalísimo. In 1940, it had the name of Copa de Campeones, and was not played again until 1945, when the ambassador of Argentina, due to the good relations with the military government, offered a trophy called "Copa de Oro Argentina". Both these tournaments were unofficial. In 1941 the "Copa Presidente FEF" was established as an official tournament founded and organized by the RFEF. In 1947 the "Copa Eva Duarte de Perón" was established as an annual and official tournament founded and organized by the RFEF, as a tribute to Argentine president Juan Perón and his wife Eva Perón. It was played between September and December, usually as one-match finals. The trophy was the predecessor of the current Supercopa de España, first held in 1982. 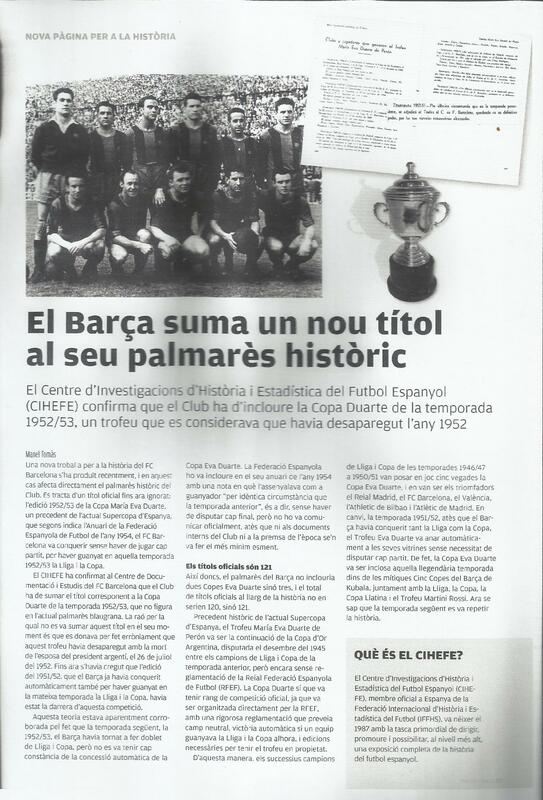 * In 1952 and 1953 the cup was awarded to FC Barcelona, as they had won the La Liga/Copa del Generalísimo double. This page was last edited on 1 October 2018, at 11:53 (UTC).